why not Feb. of March???????????!!!!! great! 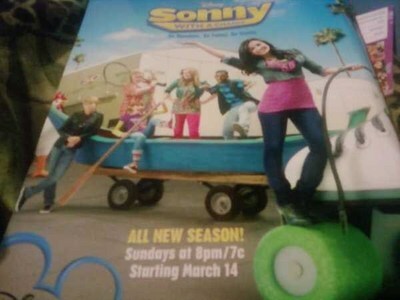 i love sonny with a chance can't wait! I'm pretty sure that it's gonna be premiered on January 17th, and if not, then the 24th. are u sure february 17? Thanks alot! I won't get mt hopes up, but at least I'll have a datum to look vooruit, voorwaarts to! It's official! It will be February 14th! Brandon Mychal Smith's main man tweeted one of the person who was in one of the forums I was talking in, and he zei that FFTF will premiere right before Starstuck on teh 14th of February! THAT'S SO COOL! That night will be the best! Sonny With a Chance and StarStruck!!! Wow i didnt know it was on disneychannel and then they reshceduled it! Did u actually see it, cause i check too, ocasionally. Well yeah i read the script too, and yeah the marathon soudns cool. ok that'll be cool if we'd tell eachother anything we know when we find out! Oh! Thanks for the info! One meer month, I can't believe it! WHY?! WHY?! march 14th I LOVE CHAD!!!!!!!!!! !